Ambient QX series has retained all the features that have made Ambient Quickpole booms so successful adding features that will especially appeal to those working on location. The QX series can easily be recognized by the characteristic staggered dimples on the screw-locks and the blue anodized collar. Ambient audio boom poles are “ Start of the Art “ in design, that will support your boom microphone in a windshield & suspension with low handling noise. 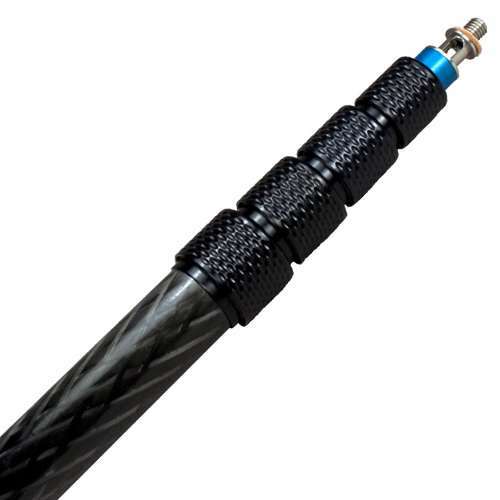 Ambient Quickpole are light yet strong in construction using carbon fibre tube 1mm thick with stainless steel 3/4 inch thread tip. The use of internal soft felt bushings, ensure rattle free operation, with no internal sizing between pole sections, without being effect by humidity or cold temperatures. The screw collets and felt are easily be replaced during cleaning and general maintenance which will give an “as new feel“ to a product that will last for years.